From asking themselves “What Would John Cusack Do?” while huddled in their Stat-Cave to bragging that if street credit was a credit card, they'd be triple platinum, the aspiring champions set to square off for the country's Rock, Paper, Scissors League title are as colorful as any faux personalities involved in Christopher Guest's mockumentaries. And even if the premise of this mostly good-humored if not overly hilarious mock documentary about RPS (the technical name for Rock, Paper, Scissors) feels a bit half baked as though it would've been far more successful as a killer comedic short film, the presentation and professionalism of the work sets it apart from most do-it-yourself indies. A word-of-mouth hit on the college circuit, director Jonah Tullis' The Flying Scissors certainly has the benefit of timeliness working for it as well. This is especially true since the release follows numerous other “hobbyist” documentaries that led us into the strange but true worlds of competitive crossword puzzlers, spelling bee contestants, Donkey Kong obsessives, and Scrabble players, only while those films were rooted in fact, The Flying Scissors is steeped in freewheeling fiction both to its fortune as well as its peril. Perhaps realizing that the premise can only be taken so far, the competition only occurs in the final twenty minutes of the movie, well after two acts have gone by as we've become introduced to a majority of naturally funny contestants as diverse as you'd expect as well as the individuals behind-the-scenes fighting against The Coin Toss Consortium for a place to match off. 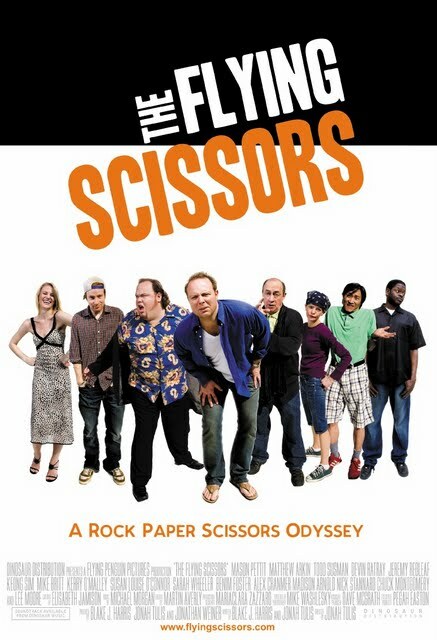 From a laid off dad in Minnesota to a nature minded feminist, The Flying Scissors seems – with good reason – very attached to its random group of ragtag players but one of the problems the film faces is that its jokes are spread far too thin across far too many contestants. While it's amusing for the first thirty minutes, I soon realized that my affection for the movie's inventive nature was tested by its ambition and it would've worked better with a mere handful of characters whose back-stories were much richer than the one or two sentences we received in between gags. For, to cite one example, The Rock (Devin Ratray), who is named thus because he always “throws rock” in the RPS matches is basically a one-note joke who's underused completely in contrast to the arthritic “juicer” who's taken performance enhancing drugs that seems topical but a bit forgettable unless we'd blended them together. Despite some of its shortcomings, there are some truly inspired moments of comedic genius as one character worries he may not have the right stuff since he won his spot on a rain day technicality when nobody else showed up and another “yes man” who works for the league earned his position after failing to sell the Iraq war to the American people as part of the Bush administration. When we cut from the talking heads that traditionally populate these documentaries that the filmmakers lampoon so well to footage of these incidents like making the phone call and realizing he won or a movie trailer ad for the war along with pretty much every scene involving the trash talking player who wrote the book on the subject, that's when the film is at its best. While overall uneven and perhaps better suited to a shorter running time, there's certainly enough promise displayed in both the production values and the intelligent writing to foreshadow that Tullis and his co-writer Blake J. Harris will both go on to continue making us laugh even harder the next time.